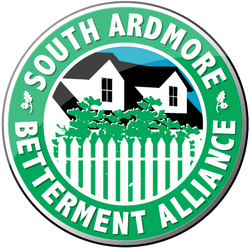 The name of this organization shall be the South Ardmore Betterment Alliance, Inc. (SABA). The principal location of the Alliance shall be in Ardmore, Delaware County, State of Pennsylvania. SABA, Inc. is a not-for-profit corporation duly organized and existing pursuant to the laws of the State of Pennsylvania. SABA is a non-partisan neighborhood organization dedicated to representing the interests of ordinary residents and homeowners of South Ardmore who wish to maintain and enhance the quality of life in our community. We are an organization under which residents can come together to acquire and disseminate information and support each other in our common goal of protecting and preserving our way of life. We seek to address resident's concerns on issues of zoning, public safety, the environment, and all issues collectively identified as necessary to achieve our common goal. To preserve and enhance the "small-town" atmosphere. To assist in the improvement of existing residential and commercial areas in order to foster a vibrant local economy. To act as a strong community force to ensure that public opinion and sentiment is represented and acted upon by our elected officials. To build a brighter future for the place we call home. Membership in SABA shall be open to all residents more than 18 years of age whose primary residence is in South Ardmore as defined below whether they be homeowners or year-round renters. South Ardmore is defined as the neighborhood bounded by the following streets: to the east – County Line; to the south – Wynnewood; to the west – Haverford; and to the north - Ardmore. Any individual or organization whose beliefs or purpose is compatible with the Mission Statement of SABA may become a member by paying dues. Eligible persons become members upon payment of dues for the current year. Membership is sustained by the annual payment of dues. The membership of a husband/wife or partner shall entitle the other spouse/partner to the benefits of membership in SABA. Dues shall be solicited by the Officers and collected by the Treasurer. The Assistant Treasurer will maintain an accurate list of members and their addresses. Annual Meeting: The date of the regular annual meeting shall be set by the Officers who shall also set the time and place. If no time and place are set, the meeting will be held on the third Tuesday of May, at 7:30 p.m. The regular Annual Meeting shall be called for the purpose of approval of the officers’ slate and for the transaction of any and all other business necessary and proper. Notice of not less than thirty (30) days of such meeting shall be provided by the Corresponding Secretary of the Alliance, by hand distribution, mail or email to members and/or publication in a local newspaper and on the website. The agenda of such meeting, if available, shall be included with the distributed notice. Regular monthly meetings shall be held as determined by the officers. A quorum shall consist of the members present and a majority of the Officers. A Nominating Committee will, in the early spring, ask via email, mail or flyer distribution to the neighborhood for all interested neighbors who wish to hold an officer position to present their names for consideration. The Nominating Committee will review all candidates and present a slate to all those present at the annual meeting in May. This slate will be voted upon at the annual meeting. President, Vice President, Treasurer, Assistant Treasurer, Recording Secretary, Corresponding Secretary, Designer/Web Designer, Public Relations Liaison, and Volunteer Coordinator. All officers shall commence their terms upon being approved at the annual meeting. The President and Vice President terms shall be staggered so that continuity of leadership is maintained. At the first annual meeting held in May of the Alliance, all officers shall be selected. No person shall be eligible to serve as a member of the Board of Officers unless he/she shall have been a member in good standing of the Alliance. The officers of SABA shall serve until the next ensuing annual membership meeting or until such later time as the officers to be elected by the Alliance for the ensuing year have been chosen. The newly elected officers and directors shall assume their respective offices upon the first day of the month following their acceptance of election to such office. The Board of Officers shall have the control and management of the affairs and business of this Alliance. The Board of Officers may only act in the name of the Alliance after due notice to, and consent of the majority of the directors. A vote of the majority of officers present at the time of the vote shall be the act of the board, provided a quorum is present at the beginning of the meeting. A majority of the Board of Officers, present or not, shall constitute a quorum for the purpose of transacting business. Regular meetings of the Board shall be held during the year, on dates to be fixed by the Board. Notice of the time and place of such regular Board meetings shall be given to all members not less than five (5) days before the date of such meeting. Special meetings of the Board shall be held upon notice to the directors and may be called upon three (3) days notice to each director either personally or by mail/email. A majority of the officers present, whether or not a quorum, may adjourn any meeting to another time and place. Notice of the adjournment shall be given to all officers. Each officer shall have one (1) vote. The Board of Officers may make rules and regulations covering its meetings at its discretion. The Board of Officers may determine the amount of annual dues payable to the Alliance. Any vacancy on the Board of Officers shall be filled by appointment of the majority of the remaining officers. The officer so appointed shall serve until that seat is next up for renewal as if there had been no vacancy. An officer can be removed by a vote of the Board for the following reasons: failure to attend a minimum of 65% of meetings; breach of confidentiality; failure to disclose a conflict of interest; failure to exercise the duties of a board member. An Officer may resign at any time by giving written notice to the Board and the Recording Secretary of the Alliance. Unless otherwise specified in the notice, the resignation shall take effect upon receipt thereof by the Board or the Secretary. Acceptance of the resignation shall not be necessary to make it effective. The resigning officer shall surrender all records, property, and any other items pertinent to the Alliance immediately upon their resignation. No officer or director shall for reason of his or her office or directorship be entitled to receive any salary or compensation but will be reimbursed for approved expenses on the behalf of the Alliance. The President may serve two consecutive two-year terms. Other officers may serve no more than three consecutive two-year terms. The President is one of the officers who must sign checks or drafts of the Alliance, under the signature of the Treasurer. Shall, in the event of the absence or inability of the President to exercise his/her office, become acting President of the Alliance with all the rights, privileges and powers as if he/she had been the duly elected President. In addition, the Vice-President shall perform such acts as shall be delegated by the President. Shall, in the event of the absence or inability of the President and Vice-President to exercise his/her office, become acting President of the Alliance with all the rights, privileges and powers as if he/she had been the duly elected President. In addition, the Secretary shall perform such acts as shall be delegated by the President, as well as record and distribute minutes of the meetings. Shall assist the treasurer as needed. Shall keep the membership records of the Alliance in good order and distribute updated lists on a regular basis. Will recruit new volunteers as needed. Shall attend to all correspondence of the Alliance and shall exercise all duties incident to the office of Corresponding Secretary. Shall be responsible for the coordination of development, design and maintenance of the website for the Alliance. The Board of Officers may create standing committees from time to time. A Nominating Committee shall be appointed by majority vote of the Board of Officers each year. A Fourth of July Committee shall be appointed. Dues: The Board of Officers will determine the amount of annual dues payable to the Alliance. Individual membership fees shall be payable each fiscal year. Any delinquent membership fee(s) shall result in immediate termination of said membership(s). Funds: Alliance funds shall be held on account in the official bank account, and reported to the membership at general meetings. Any amendment to the by-laws may be proposed only by the Board of Officers, or upon petition of twenty-five (25) members. These by-laws may be altered, amended, modified or repealed by an affirmative vote of not less than two-thirds (2/3) of those members present and voting at the annual or special meetings of the Alliance duly called as provided by these by-laws. No such amendment shall be made unless draft amendments reviewed by the Officers prior to a general meeting. Proposed amendments cannot jepardize the tax-exempt nature of the Alliance. The Officers will then publish the amendment at least fifteen days prior to a meeting. Such notice shall specify the time and place of the meeting along with the proposed amendment(s). The fiscal year of the Alliance shall be from July 1st through June 30th. The individual Officers, and Members of SABA will not be held accountable for any and all liabilities of the Alliance. Upon the dissolution of the corporation and after the payment or the provision for payment of all the liabilities of the corporation, the board of officers will dispose of all of the assets of the corporation exclusively for the purposes of the corporation or to organizations that are then qualified as tax-exempt organizations under section 501 (c) (3) of the Internal Revenue code. Any assets not so disposed of will be disposed by a court of jurisdiction in the county in which the principal office of the corporation is located.